University Art Museum (UAM) at California State University Long Beach will present twelve radiant new and recent geometric abstract paintings in Patrick Wilson: Pull. 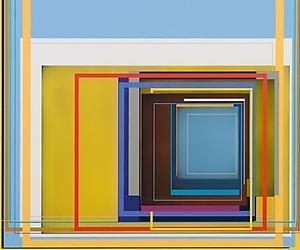 Wilson’s intricately layered compositions wed glowing color fields to structured shapes. Transparent squares, rectangles and narrow lines of acrylic paint draw the viewer into the pulsating depths of his fresh artworks. Three works on paper from the 2008 series, Suite for Mount Washington, will also be included in the exhibition. These gouache serigraphs, made under the master printer Christian Zickler, directly influenced the complex visual syntax that presently informs his current painting practice. Wilson’s surprisingly straightforward creative process is at the core of the luminous paintings in Pull. He pulls thin films of acrylic paint and emulsion across his surfaces with drywall blades and rollers, parsing controlled work areas with masking tape. The physical properties of the medium come to the surface in chromatic calibrations floating in space. UAM Curator of Exhibitions Kristina Newhouse suggests that Wilson’s technique reflects a larger outlook on duration, asserting that the artist “invokes duration both in his acts of creative ‘unfolding’ as they transpire in the studio and in his expectations about viewers’ subsequent reception and interpretation of his artwork.” The hued gradients function like leading lines, meant to guide the viewer to interpretative insights. Gentle tonal variations make the artworks in Pull both sensual and meticulous. Although Minimalist in nature, these paintings do not sit still. Newhouse finds dynamism in the exhibition, saying, “Wilson’s stratified color fields jiggle, flicker, and shift, destabilizing static interpretation. They move...and propose that viewers move too, through their own perceptions and recollections of color and light.” Indeed, visitors that encounter Wilson’s work will not look at it -- they will peer into it. Pull presents artwork that takes on many forms, translating color into watery depths and ethereal light.